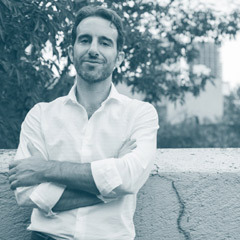 Hailed by Down Beat magazine for his "quick-witted harmonic reflexes, fluid command of line and cut-to-the-chase sense of narrative logic," Aaron Goldberg has made his name worldwide as one of jazz's most compelling pianists, both as a bandleader and frequent collaborator with the finest exponents of the music. As a bandleader Aaron's passion for swing, melody and groove has long been paired with a keen appreciation of other musical cultures, as documented on his 5 acclaimed trio albums and over 80 more as a co-leader and collaborator. As a high school student at Milton Academy in Boston, Aaron was introduced to jazz by bassist-educator Bob Sinicrope and master saxophonist Jerry Bergonzi. As Aaron puts it, "At first improvisation was a mystery and a puzzle, but soon it became a profound inner and outer journey as life and music entwined." After receiving awards from Berklee College of Music and Downbeat Magazine, Aaron moved to New York City at age 17 to attend the New School for Jazz and Contemporary Music, and devoted his off-hours to performing in New York clubs. Upon graduation he promptly moved to New York, formed his first longstanding trio featuring his peers Reuben Rogers and Eric Harland, and began touring worldwide with such multigenerational masters as Joshua Redman, Wynton Marsalis, Al Foster, and Kurt Rosenwinkel. Despite a demanding touring schedule at the world's most high-profile venues, Aaron has also maintained both his academic and sociopolitical interests, receiving a Masters Degree in Philosophy from Tufts University in 2010. Over a 16-year span Aaron produced and performed in Jazz for America's Future, four major fundraising concerts for the presidential campaigns of Kerry, Obama and Clinton. He is also a frequent visitor to Haiti for a variety of educational and musical projects. Aaron is a faculty member at the New School for Jazz and Contemporary Music and William Paterson University and a frequent clinician at conservatories, universities and workshops worldwide. He is the co-arranger/composer of the Baby Loves Jazz collection of books and cd's, and for a decade has been the musical director of All Souls at Sundown, a jazz and poetry series. Aaron's upcoming album, "At the Edge of the World" is a new trio project featuring Matt Penman on bass and the dynamic Leon Parker on drums and body/vocal percussion. Aaron resides in New York City.